Voices! Research and Consultancy is a company with focus in marketing, social research and polling both locally and globally. 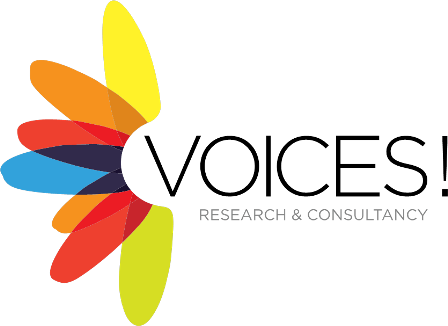 The aim is to provide high quality research and consultancy to organizations and companies, using rigorous methodologies and innovative approaches. Voices! team has participated in the world’s most important surveys and has more than 30 years of experience in national public opinion surveys in population, measuring systematically different variables regarding the political, economic, and social situation in Argentina, as well as the social habits of the population. • Research and Analysis Area: Multi discipline teams made up of: Sociologists, Political Analysts, Economists, Methodologists, Psychologists, Marketing, Statisticians, Systems, and Mathematicians. • Computer Area: Programming specialists for CAPI and CAWI using Survey To Go. • Data Processing: Computer center whose key staff has more than 25 years of experience using the SPSS (Statistical Package for Social Science). • Statistics Area: We work with a Statistics and Cartography Department that has more than 15 years’ experience — Samples and statistical analyses are carried out and validated in-house at Voices Argentina. Additionally, Voices Argentina has cartographic census digitalized information, worked out on special software that allows for the incorporation of new variables to the existing data.